Sevilla is a province that offers a great variety of open-air activities, which are either free or very cheap to enjoy. The beautiful natural surroundings of the town, lying on the banks the river Guadalquivir and surrounded by mountains, makes it a paradise for people who like trekking, rock climbing, and for nature lovers in general. - The Maria Luisa Park, which is located close to the Cathedral and has a surface greater than 400.00 square meters. The park was built as a romantic garden for the San Telmo Palace and here you can also find the impressive construction Plaza Espaa. - The Murillo Park bordering the walls of the Alcazar with its many flowerbeds. - And the new parks constructed for the Expo 92 along the river (Alamillo, the garden of the Guadalquivir and the Garden of San Jernimo). For people interested in doing a nice bargain there are several street/ flea markets throughout Sevilla. 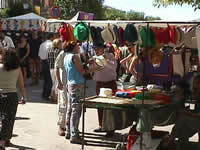 El Mercadillo de la Alfalfa is a market held every Sunday morning on the street Alfalfa. In this market you can find all types of pets (dogs, cats, birds, etc.). If you are interested in old coins and stamps the market Filatelico (Plaza del Cabildo) are open every Sunday morning. The Major market Alameda (Alameda de Hercules) is open every Sunday morning. Here you can find books, clothes, shoes and electronics. In the Thursday market (calle Feria) you can mainly find ceramics, furniture, books, antiques and paintings both new and second-hand.